Wing's tubes are U.S.-designed and manufactured, using 40 oz. industrial grade. 100 percent polyurethane coated fabric. The use of this specialized fabric, coupled with Wing's advanced construc- tion techniques and unique design. ensure a precise fitting, low maintenance tube incorporated within each RIB. Combining the resiliency of Dow 2.2-lb. Ethafoam. the strength and durability of a polyurethane sheath and the pneumat- ic shock absorption of an air bladder. creates the air/foam hybrid collar. In addition. Wing's air sponsons. which attach to any RIB hull, provide a soft impact and less shock to the vessel dur- ing boarding operations. Air inflated tubes also bend under pressure, thus offering shock absorption at higher speeds and increased maneuverability in rough seas. Ribster series are the first military RIBs with foldable, collapsible and storable hulls. This combined advantage of the rigidity, seaworthiness, speed and com- fort of a RIB. with the convenience of a totally collapsible inflatable, makes it the right choice for professionals who need tough, durable boats, but whose storage or transport space is limited. Ribster utilizes a heavy-dutv aluminum hull that is structurally reinforced for added durability and toughness. PURIICITY WITH MARITIME REPORTERI "The day our advert first appeared in Maritime Reporter enquires doubled... sales leads resulted... we were very pleased!" CWF Hamilton & Co. Ltd.
Get the response your company needs! 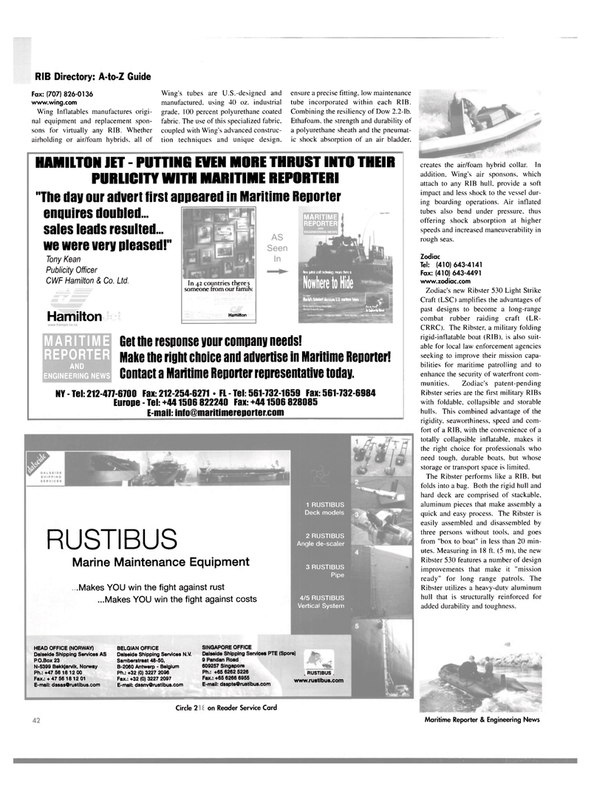 Make the right choice and advertise in Maritime Reporter! Contact a Maritime Reporter representative today.